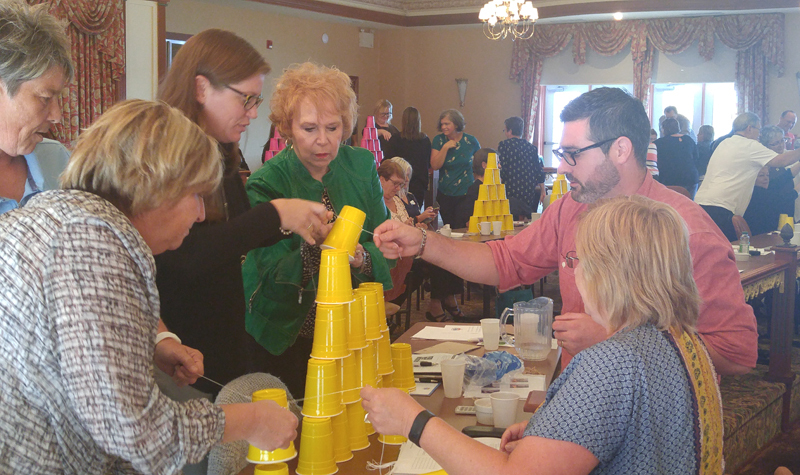 The Riverview Manor team is pictured here stacking cups into a pyramid using elastic bands during a presentation from Jayne Harvey at OMNI’s Quality Forum on Sept. 27. The exercise was aimed at demonstrating the challenge of balancing care and safety. ORILLIA, Ont. – Resident safety is everyone’s responsibility when providing care in a long-term care home, and safety focus is not something that should be separated by departments – it needs to be a concerted effort from all team members. This was the key message in Jayne Harvey’s presentation at OMNI Health Care’s Quality Forum, entitled Maximizing Resident Care and Safety. Jayne, a registered nurse, motivational speaker and consultant, is a longtime fan-favourite at the forums. While her presentations are always captivating and peppered with her gregarious humour, her messages are serious. She says the issue of resident safety has always been important in the long-term care sector, but homes today provide more complex care and that sometimes requires extra attention being paid to safety. “It requires eyes wide open all the time,” Jayne says. Jayne says the one thing she hopes managers walked away with from her presentation is that a daily culture of safety and the continuous reinforcement of safety habits is crucial in long-term care homes. To underscore the challenge that sometimes comes with balancing resident care and safety, Jayne had a unique exercise for managers to perform during a breakout session. Each home was given a set of plastic cups to pile into pyramids. But there was a catch: teams had to stack the cups using elastic bands tied to form loops which were used to pick up each cup. It wasn’t an easy task, but the teams managed to get the cups stacked. “Turning safety into a fun experience where people have to work as a team, you’re trying to create the same outcome, but there are risks involved and people experience that hands-on,” she says. OMNI’s annual Quality Forum was held at Fern Resort near Orillia Sept. 26-28. The forum brought together managers from the organization’s 18 long-term homes and included presentations, events and networking opportunities to help homes enhance quality service to their residents.